By straight up we mean no gadgets, gizmos or batteries- just a straight up good design that works well! The Classic Feeders by BirdsChoice, and The Big Top by Droll Yankees are two off the bat. Nuttery has been making their cool feeders for 20 years. Wildly popular in the UK, and now available in the US. 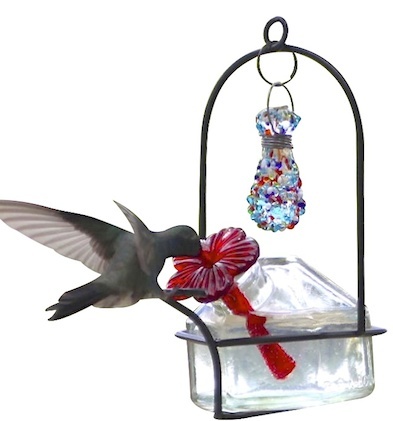 They’re mod and colorful squirrel proof bird feeders for peanuts, suet or seed. 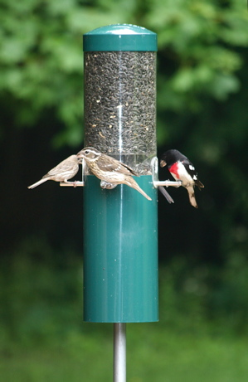 The horizontal launching point (HLP) must always be considered when placing ANY feeder. What is HLP? Ok, we made it up but it really does exist! When furry acrobats are able to access a feeder by jumping sideways from a structure, tree, limb, fence, or anything which might present them a launching opportunity! Some can fly as far as 8-10 feet sideways. Although the term squirrel-proof is used rather loosely, we’re not sure if anything really and truly fits the bill? But there are definitely some feeders that fall within 98%. In hanging or pole mount with built-in baffle, the Classic is… well pretty much classic! It’s been around at least 25 years which says something for the design itself. 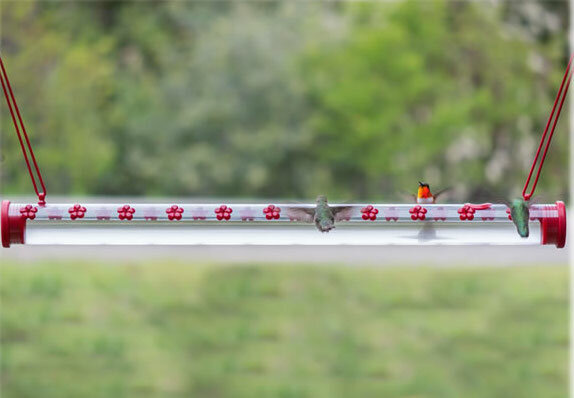 The hanging style comes in two sizes with a weather guard to protect seed ports and birds from rain and snow. Squirrels just can’t reach down far enough to access seed. 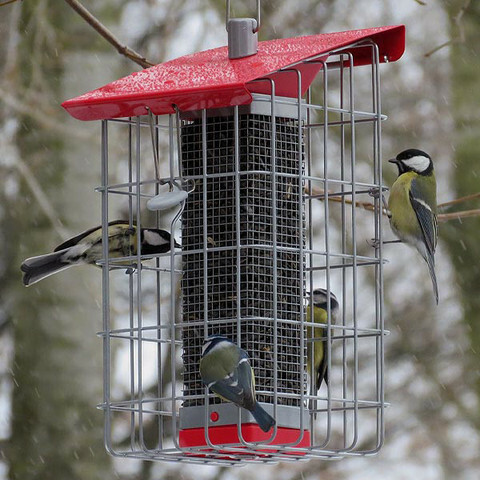 With the pole-mount feeder (weather guard optional) they can not get passed the baffle… it’s both genius and simple and above all, time-tested. 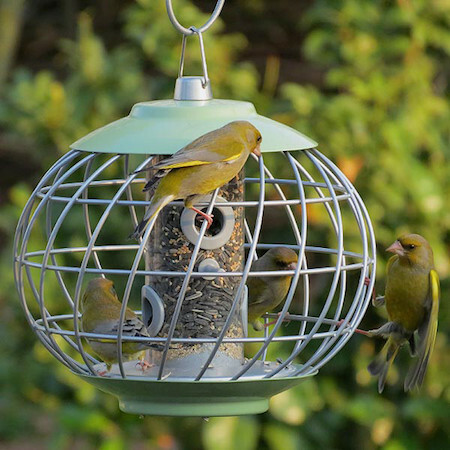 No need to make a headache for yourself (or your birds) when there’s some great squirrel-resistant feeders out there! It’s a great opportunity for kids and grown-ups to meet some local raptors up close and personal! 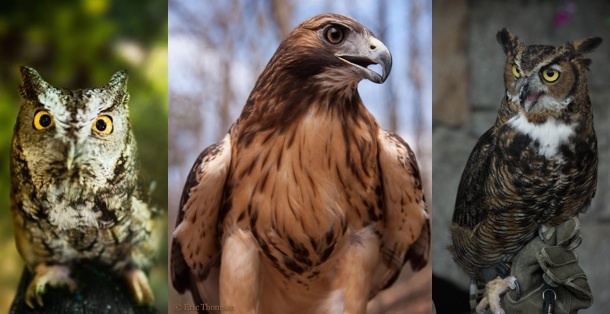 Beth Thomas (wildlife educator) is bringing 5 of her majestic birds for a presentation with Q&A’s and photo ops. Our local Wild Birds Unlimited in Dallas, GA happens to be celebrating their 10-year anniversary with a special day of learning, fun, refreshments and savings… raffles for products and face painting for kids included! If you reside anywhere nearby, it’s worth the trek to come see the owls and hawks like you’ve never seen them before!